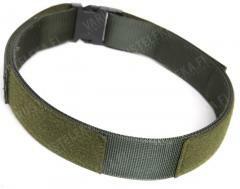 A belt to go with the M05 vest. While perfecting the fit of the vest, the belt serves as a base for the leg rig attachment. Indestructible, very sturdy belt. Adjusted with velcro slabs, closes with a large plastic QR buckle. Width about 5 cm. Normally the belt is tucked through the vest's inside belt loops. Made of military grade nylon, double layered. The quality is excellent overall, as should be expected. This is a great belt. It is very rigid, and totally adjustable. It's hook and loop is top quality. There is quite a bit of it on either side for lot's of adjustment. Great product.